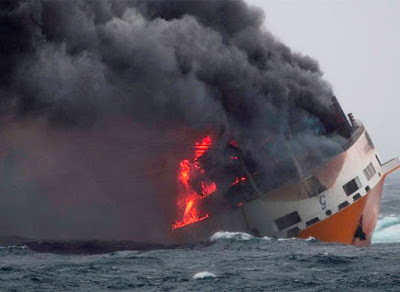 The fire stricken Italian ship, MV Grande America, owned by the Grimaldi Group, has sunk in the Bay of Biscay in water depth of 4,600 meters off the coast of France. According to France’s Marine Nationale, the ship, a container-roro carrier, sank on Tuesday at 1526 local time about 180 nautical miles off the French coast. Fire broke out on the Grande America on Sunday night. The ship was underway in the Bay of Biscay during a voyage from Hamburg, Germany to Casablanca, Morocco. The fire was primarily located in cargo containers in the forward portion of the ship. Several containers fell off the ship into the water while it was burning before it eventually sank on Tuesday afternoon. Ships and Ports reports that the 213-meter, 27,965 dwt Grande America was built in 1997. It was carrying 2000 cars and 365 containers bound for Lagos, Nigeria.